Welcome to episode 15 of the EdTech Situation Room from June 28, 2016, where technology news meets educational analysis. 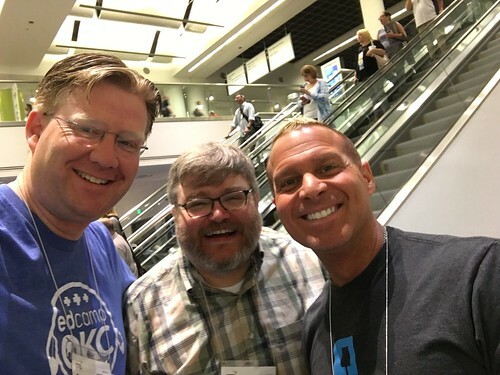 This week Jason Neiffer (@techsavvyteach) and Wesley Fryer (@wfryer) were together in person at the ISTE Conference in Denver, Colorado! Following the day 2 keynote, they recorded a conversation about some of the exciting new announcements by Google, Amazon, and other companies during ISTE. Check out the podcast shownotes for links to referenced articles, which are also available on http://edtechSR.com/links. We had recording problems (again) with Blab, so are considering moving to a new livestreaming platform for the show. If you have suggestions we’d love to hear them! We’re considering Facebook Live or YouTube. We will NOT have a show next week on July 6 but should be back July 13. Follow us on Twitter @edtechSR to stay updated about days, times, and links for future live shows. We’d love for you to join us live if you can, and to send us feedback whenever you are able to listen to our show. Thanks for tuning in!